Sumner is associate professor of ministry and theology at Azusa Pacific University. Although brought up in a conservative family, she found herself attracted to a public speaking ministry. Eight to ten years ago she began to see inconsistencies in the complementarian limits on women in ministry. 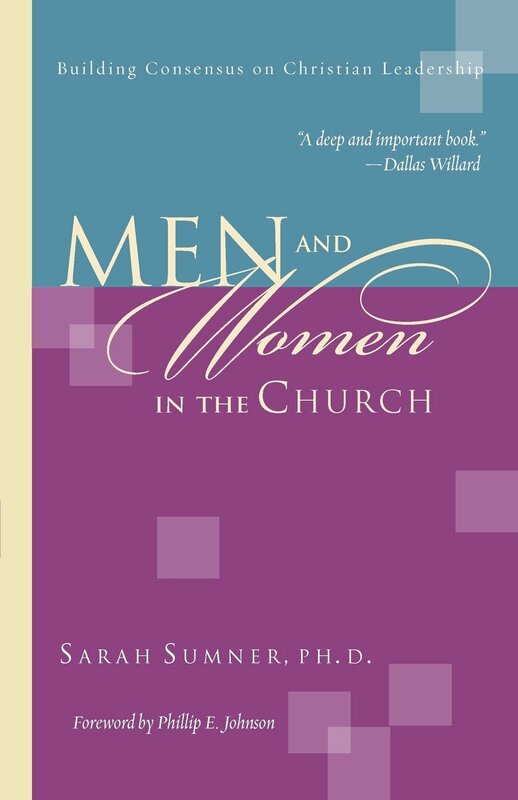 Sumner's goal is to create "a theology of women woven into the narrative" of her story (p. 32). Part one of the text begins with Sumner's own history (chs. 1-2). She then explains the impasse between complementarians and egalitarians (chs. 3-4), the nature of women and men and of God (1 Cor. 11:7, chs. 5-9), how to interpret the Bible (ch. 10), woman as "weaker" vessel (1 Peter 3:7, ch. 11), husband as "head" (1 Cor. 11:3, ch. 12; Eph. 5:1-21, ch. 13), God as "head" of Christ (chs. 14-15), headship versus entitlement (ch. 16) and 1 Timothy 2 (chs. 17-20). In part two of the book, Sumner responds to the dilemma raised in chapters 1-4, offering help in building consensus in Christian leadership between complementarians and egalitarians (chs. 21-23), highlighting sexual sin as a major cause of division between men and women (ch. 24), and closing with her ongoing personal narrative and vision for the church (ch. 25). Men and Women in the Church is replete with insights over the meaning of Scripture. Sumner presents four views: the traditional, complementarian, egalitarian, and her own, which she hopes may break the current impasse. But in reality, it appears to be an egalitarian view, isolated from the egalitarian community. What helpful insights does Sumner present? 1. In contrast with Leon Podles, Sumner argues that "masculinity" does not derive from men separating from women. Adam did not "separate" from Eve, but rather clung to her (Gen. 2:24, pp. 92, 106, 141, 166). 2. Men need to be relational since God said it was not good for Adam to be alone (Gen. 2:18, p. 110). 3. God did not commission Adam to subdue and rule the woman (p. 321). 4. In Ephesians 5, Paul encouraged men to sacrifice, not "lead"(pp. 160, 162). 5. Most effective marriages function, in reality, as egalitarian partnerships (p. 202). 6. Women are warriors who reflect God's power, not only God's tenderness (p. 107). 7. Women as "weaker" vessels are simply more vulnerable physically (p. 134). Sumner sees the church festering with an underlying worldly competition between Christian men and women. She also notes that we all agree that men and women are equal and distinct but differ on what aspect to highlight: equality or distinctiveness. At times, Sumner seems to reduce the egalitarian perspective. In this sense the book builds "compromise" rather than "consensus." For instance, she agrees with Wayne Grudem that ancient Greek literature has "no conspicuous examples of kephale meaning 'source'" (pp. 151, 291). However, in a footnote she also agrees that head means "source" in Eph. 4:15 and Col. 2:19 (pp. 151 n.16). Sumner does not believe the Bible teaches "mutual submission" in marriage, yet the husband and wife should "lift each other up" (p. 171). Sumner describes egalitarians as biblical feminists who grant feminist thought more authority than Scripture (p. 281). However, to say CBE leaders think "classical feminist thought" is more authoritative than Scripture would be in direct contradiction to CBE's mission statement and the body of egalitarian scholarship. Sumner concludes that goddess worship in Ephesus was relevant to Paul's prohibition of women yet nowhere cites agreement with Cathie Kroeger's exhaustive study in her book I Suffer Not a Woman. Thus, I see Sumner as agreeing with the overall mission of CBE, even though she may not agree with the phrase "mutual submission." Sumner says metaphors are not meant to be defined; they are mysteries (p. 152). However, a metaphor is a figurative analogy. Any analogy should be analyzed and "defined." This limitation of understanding at times reduces some descriptions of biblical imagery. For example, even though she is careful to conclude that God is not masculine, she states that the church has to be feminine to Christ's masculinity. But the imagery for the church varies. For instance, in Ephesians 4:13 the church is imaged as a mature man. The problem stems from Sumner deducing that if a wife is a "body" to a "head" of the husband, then "body" is always a feminine image (pp. 185-6). But the latter does not necessarily follow since metaphors and similes are used differently in different contexts. Throughout the book, Sumner claims that the only right people have is to become "God's child." For her, women do not have the right to serve as teaching pastors but the duty to do so if they have been called. However, I believe we humans do have God—given rights beyond Sumner's definition. But our human rights work together with God's grace. For example, justice is a right. Abel's blood cried out to God from the ground (Gen. 4:10). Workers have the right to be paid (1 Tim. 5:18). Sumner has faith that with time those in authority will embrace the gifts of all individuals, regardless of gender. I agree with her view that the process of change can take time. However just as God vindicates, we humans also can pray for boldness to act (Acts 4:29). Moreover, not all authoritative leaders are open to God's will. Sin can be conducted on individual and corporate levels. Leaders may be more interested in power and control than truth. Sumner aptly reminds us to try to keep the unity of the church when we seek change. But, she neglects to recognize that after a while, stoical waiting may have to end. Despite some limitations, Men and Women in the Church is a worthwhile book to read. Sumner has an important goal to achieve: consensus on Christian leadership. What I found most helpful were her insightfully fresh readings of biblical texts and relational dilemmas.